We are really excited to have opened our newest counselling room in Sheffield which has become our 7th counselling venue. This is the first time that we have offered counselling outside of the North West. This is significantly due to one of our former counsellors, Kay Wells, having relocated there. 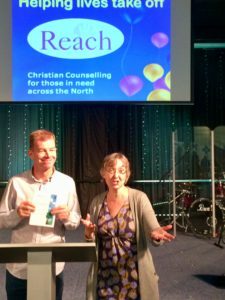 Kay met with a range of church leaders who were all saying that there is nothing being offered in Sheffield similar to the Reach model, and therefore they would welcome Reach coming to Sheffield. We are delighted to be able to partner with St. Thomas Philadelphia who are generously allowing us to use one of their rooms for counselling. Andy, our co-ordinator, and Kay (opposite) spoke at a launch event at St. Thomas in September and our counselling room is now ready and open for use. We hope and pray that many hurting people in and around Sheffield will benefit from this service.